Aphetto Alchemist. (c) 2013 Wizards of the Coast. When it comes to “rogue decking,” how exactly do you brew? And no, I’m not talking about logging onto mtgtop8.com, searching rogue builds, and tweaking the tech to contend with your local meta – I’m talking about sitting down, fortressing yourself with a collection of cards, and wildly applying critical thought to develop a new, potent recipe; much like a seasoned cocktologist, surrounded by liquor, herbs, syrups, and juice – everything must be in the right place, with the proper amount added, or surely it’ll be bitter (pun). To ensure a good blend, take into consideration factors such as mana curve, land base, play style, and, most importantly, the to-beat metagame. So, where to begin? Do you pick a color scheme to build around, i.e. Bant? Do you select a single card? Do you choose your favorite guild? If you answered yes to any of those questions, you’re more than likely a casual player who has never experienced the headache that is home brewing for a serious competition – and there’s nothing wrong with that. Sure an ‘Orzhov’ deck, or an ‘Aurelia’ deck are neat, but they don’t match up with tier 1 builds, and this is where many casual players fall short: they try to tune their casual decks for competition and ruin the fun of a good deck. Make note which of your builds are just for fun, and which are tournament contenders; this should help you decide where your time and money are best channeled. Starting a brew from scratch is simple: the goal is to create a unique and powerful deck that nobody at your tournament is prepared to deal with. If you intend to tweak a current build, like Naya Humans, expect plenty of your opponents to have sideboard answers such as Blind Obedience & Rolling Temblor. Instead, look for pinholes in your competition and magnify them. Do not hesitate to mainboard the usual sideboard tech if it makes sense. Roughly 80% of my Modern meta is using some variant of aggro (mostly tribal), so I mainboard Ghostly Prison in my White Weenie deck to slow down opposing aggro. But why stop with one card? Why not design a deck to maneuver through your entire meta with impunity? Add plenty of combo-counter, an unpredictable win condition, and multiple layers of protection; now that sounds solid, in theory, but what does that look like on paper? Allow me to share a rogue-build of my own that I’ve been fine-tuning for the last three weeks; it’s far from perfect, but I believe that it illustrates the breadth and depth that goes into a strong brew. The functions of this deck are simple: gain tons of life and ramp hard. Seems easy enough, right? Exactly, it is – and it works. Why? Because of what we do with that extra life and mana. So what do we do? Well let’s start with the primary win conditions. First up is Chalice of Life. This artifact gains us life, which not only contributes to its transformation, but restores life spent on our Killing Waves, Underworld Connections and Pain Lands. The transformation of this card is so powerful! 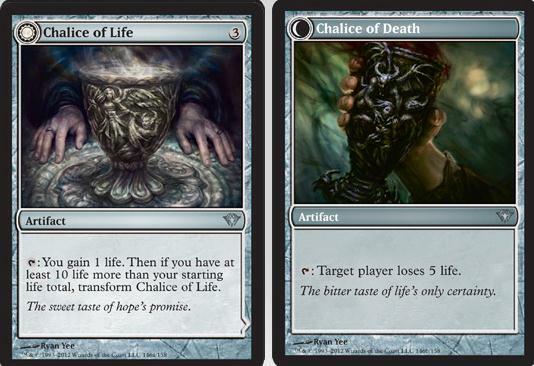 Chalice of Life / Chalice of Death. (c) 2013 Wizards of the Coast. It may seem as if getting to 30 life could take awhile, but with the help of Griselbrand, Thragtusk, Vampire Nighthawk, and Crypt Ghast’s Extort ability, it’s rather easy. Once at 30+ life, you can gleefully tap away your Chalice of Death, inflicting 5 points of damage every time. Now for our second win condition: Duskmantle Guildmage! With so much mana ramp between Crypt Ghast, Arbor Elf, and our ‘Swamps’, it’s not difficult to cast a large Mind Grind, mill 10+ cards, and kill your opponent with Guildmage’s effect. Speaking of milling 10+ cards, Jace, Memory Adept is a huge threat for damage when paired with Duskmantle. Our third win condition is sweet and simple: cast Army of the Damned and rawr-smash-face with tons of zombies. And finally, the obvious and brutish win condition here is to mill your opponent’s deck to 0 with Jace, Guildmage, and Drownyard. Beyond multiple win conditions, this deck offers a lot of tech; most of which has great synchronicity with other cards in the build. At first glance, it’s easy to spot TONS of life-gain, but after a second and third look-over of the list, you’ll notice that there are many outlets to spend that life to gain an advantage: Griselbrand, Underworld Connections, Killing Wave, and Pain Lands all cost us life at some point in the game, but provide great trade-offs. If you’re running low on cards, Griselbrand and Underworld Connections are there to refill your hand, so that you can keep on digging for your kill – though Griselbrand can be a win-con all by himself. If you find yourself being pressured by aggro, cast Killing Wave and watch the tides turn as mid-game approaches: aggro players tend to pay the life, only to get bricked later by Nighthawks and Thrags that quickly overwhelm the field and expand the gap between life totals. Killing Wave also gets around hexproof (to an extent), and pressures decks that aren’t overly concerned about board wipes (like BWR Aristocrats). 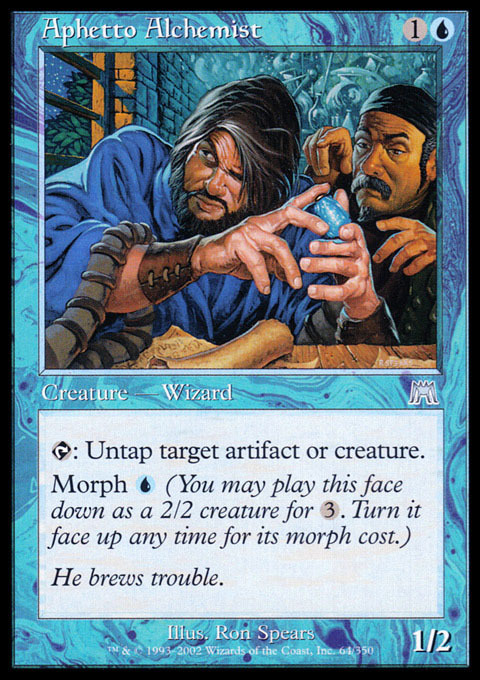 Increasing Ambition is a small piece of tech that offers crucial assistance, such as: grabbing a Thrag to help transform Chalice; grabbing a Mind Grind or a Jace to finish milling; or grabbing Army of the Damned to overrun your opponent. Our final piece of tech in this build is Alchemist’s Refuge; with so much mana at our disposal, this baby is affordable and attractive. Casting a Chalice and transforming it before your upkeep is AMAZING; so is flashing in a Nighthawk or a Thragtusk at the end of your opponents turn, or as a blocker. Versatility is the fruit of the land, and this deck has plenty. Thank you for reading my ramblings of brewing; hopefully you’ve gathered something beneficial from this, even if elementary. I apologize for the lack of financial content, but I wanted to explore a topic that in a very unnoticeable way, redefines the prices within our market. All it takes is one weekend of some rogue brew to top a GP, for a card like Craterhoof Behemoth to skyrocket in price. This will conclude my weekly installment for MTGPrice.com.